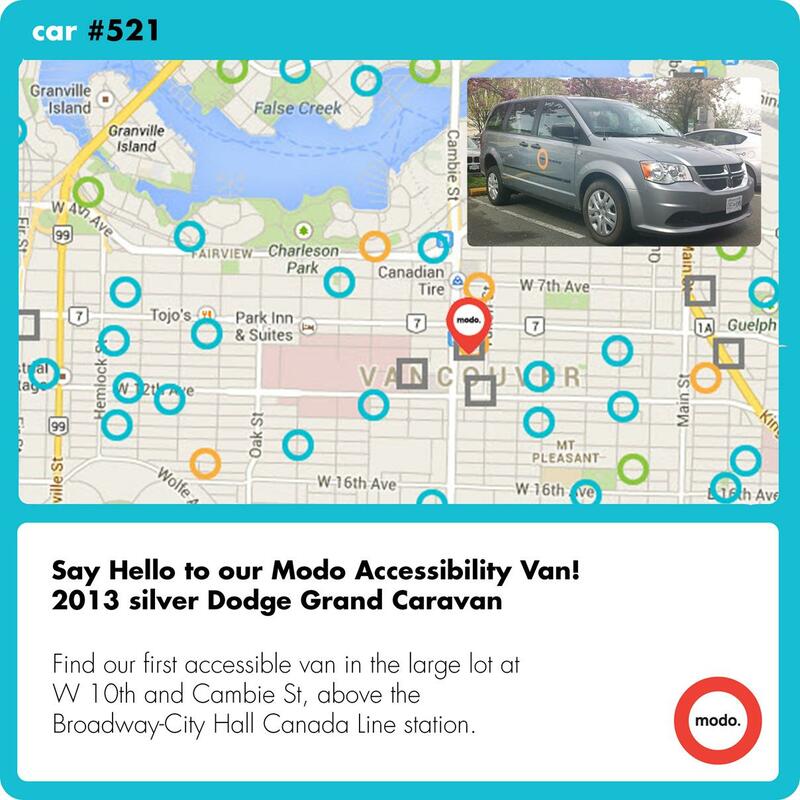 As you may have heard, Modo just added an accessible van to our fleet! This is a first for Modo, and we're very excited to offer increased accessibility for current and new members. The van uses a rear-entrance folding ramp, and includes wheelchair tie-down straps. Detailed instructions can be found on our website at modo.coop/accessibility. Centrally located, our Accessibility Van is just off the Canada Line and can be booked for an easy trip to the Richmond Oval for athletes, or maybe Cypress Provincial Park for nature seekers. Wherever you go, we'd love to see a photo from your journey, so share them with Modo's Facebook or Twitter! In January, at our Annual General Meeting, the Modo board announced that it would begin searching for a Chief Executive Officer, as our Executive Director, Phil Baudin, would step into the role of Finance Director. Thanks to our friends at REALIZE Co-op who conducted the executive search, we are proud to introduce the successful candidate, who, fittingly, hails from another well known co-operative. Nathalie Baudoin was previously Chief Marketing Officer for Mountain Equipment Co-op (MEC) and is eager to bring her co-op experience and skills to Modo. "I'm thrilled to join Modo, and with your help, I hope to grow our little co-op and expand carsharing across the Lower Mainland. It is an honour for me to take the helm of such a dynamic and well respected organization. Having worked at MEC, I understand the co-operative model. In particular, I understand how you, our members, can be ambassadors and help us grow the movement. I'm looking forward to getting to know you over the years!" Please join us in welcoming Nathalie to Modo! Carsharing royalty Robin Chase, co-founder of Zipcar and Buzzcar, is coming to Vancouver, thanks to a new event series from the folks who brought you Pecha Kucha Vancouver. May 29–30, FUEL brings thought-leaders and innovators from around the world to gather in Vancouver to connect with local entrepreneurs, designers, engaged citizens and, perhaps, you. Hosted by Cause+Affect and created in collaboration with THNK, the School of Creative Leadership, FUEL will explore four sectors – food, design, sustainability and technology – through a series of interactive experiences. From panel discussions to workshops, participation is highly encouraged as FUEL seeks to plot a collective future and ignite the culture of our city. Sponsored in part by Modo, keynote speaker Robin Chase will light up the stage with stories of her experiences as a leading figure in the Sharing Economy. Get a sneak peek on Robin's talk, including her plans for the future, in this great interview with Jane Cox, Director of FUEL. 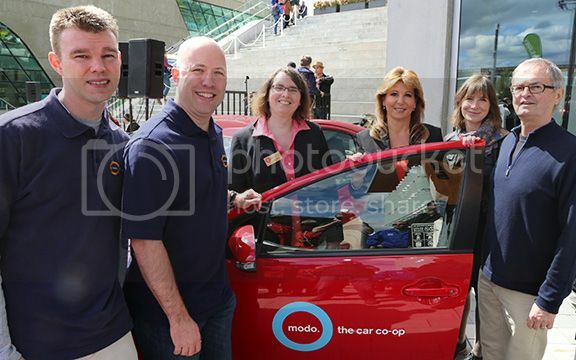 The Modo team with Surrey Mayor Watts at the Grand Opening of the new City Hall. Pictured from left: Kelvin Stoke, fleet manager; Joel DeYoung, board of directors; Karen New, information systems director; Mayor Dianne Watts, City of Surrey; Hilary Henegar, marketing director; and Phil Baudin, finance director. This summer, we'll be at Surrey Urban Farmers Markets to spread the word about local carsharing and sign up new members. Tell your Surrey friends to stop by for a special promotion! DOXA Documentary Film Festival has brought some of the best thought-provoking documentaries and short films to Vancouver over the years. We're thrilled to once again partner with them as Official Transportation Sponsor for this year's festival! One of the many benefits of our Community Partnerships is meeting the people behind the organizations. These teams of dedicated individuals work tirelessly to deliver interesting and engaging cultural programming within Metro Vancouver, making our region a more vibrant place to live. 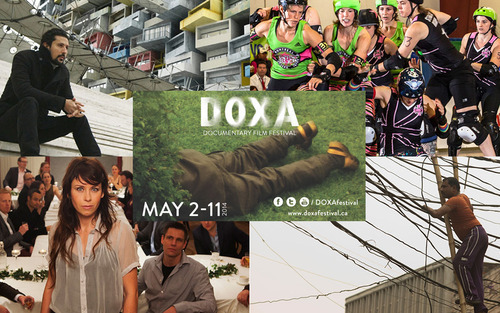 Doxa begins tomorrow, May 2 and features nearly 100 films. For some recommendations by DOXA staff and board, as well as news regarding a uniqe Modo Member volunteer opportunity, read our Modo blog section below! Victory Gardens is one of Modo's newest Business Members and Community Partners. This worker co-op of urban farming consultants helps people turn their lawns into food forests. As a special perk, Victory Gardens is offering Modo members a 5% discount on veggie garden installations when you purchase a consultation through their online shop. You'll also receive a packet of organic, non-GMO seeds to get you started! Use the promo code MODO to access this perk. >> WELCOME to our newest Modo for Business members, including the happy folks at Maker Mobile (pictured)! >> VOLUNTEER Want to score free tickets to DOXA? Have we got an opportunity for you! >> PRO TIPS A few simple reminders to keep your trip as smooth as possible. Remember, if you ever have trouble there's one easy answer: Call Modo! >> PORTLAND: Car Rental vs Car Sharing A Modo member road trips to Portland twice to compare. >> MODO RECAP Looking back at Surrey's annual Party for the Planet! The YES is a summer co-operative leadership camp that provides week-long retreats for teenagers from across BC. Focusing on self-awareness, co-operation and global awareness through outdoor activities, The YES builds a strong foundation of co-operative skills and values for leaders of tomorrow. Every year, Modo sponsors two teens for The YES Camp. We sponsor members' children first and foremost – but other family members will be considered! To nominate your youth to be sponsored by May 23, email annika@modo.coop. Find camp dates and details here. 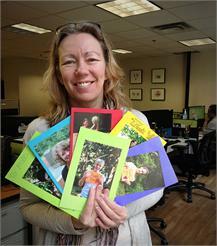 Modo Office Manager, Annika White shows off a few of the Thank You cards we've received from campers. The Yaletown Farmers Market returns on May 1! Easily accessed by foot, bike or Canada Line. Win 2 tickets to Microtopia, May 10! To enter, post to Twitter, FB, LinkedIn or your blog about how Modo helps you live lighter and leaner, and send us a screenshot to freestuff@modo.coop. Vancity members can explore Science World for half the regular price on Saturday, May 10. Present your Vancity Member debit card or Vancity Enviro Visa to access this promo! Get 25% off your ticket – find promo codes at the top of the newsletter! The 4th annual Vancouver Mini Maker Faire takes place this year at the PNE Forum. Known as "the Greatest Show (and Tell) on Earth," VMMF is a place where people can show their creativity, resourcefulness, and share what they are learning. There's now a 2009 red Dodge Grand Caravan (#253) instead of a 2008 Grand Caravan. There's now a 2012 blue Nissan Versa sedan (#345) instead of a 2013 Dodge Avenger. Find a 2014 red Nissan Versa Note (#527) under the Burrard Bridge, at the eastern corner of the Vancouver Aquatic Centre parking lot. We have a designated stall at the end of a short footpath from Beach Avenue. Find a 2012 light blue Toyota Prius V (#357) behind the Vancouver Park Board office, at the foot of Pendrell Street near Stanley Park. Our stalls are in the southeast corner of the lot; look for the Modo signs mounted on the railing. ABANDONED LOCATION: We've given up our parking spot at Beach because of recurring vehicle damage from the pillars. There's now a 2012 blue Toyota Prius C (#393) instead of a Prius V. The smaller car will fit the space better and incur less vehicle damage. We've brought a minivan to Gastown! There's now a 2012 grey Chevrolet Orlando (#525) instead of a Prius C.
The 2013 green Fiat 500c (#512) continues to float here until its permanent home is ready. There's now a 2014 blue Chevrolet Orlando (#526) instead of a 2009 Grand Caravan. There's now a 2010 blue Dodge Grand Caravan (#299) instead of a 2008 Grand Caravan. We're thrilled to announce our first wheelchair-accessible van, a 2013 silver Dodge Grand Caravan (#521). There's now a 2014 brown Chevrolet Orlando (#528) instead of a 2012 Nissan Versa. There's now a 2014 grey Dodge Grand Caravan (#524) instead of a 2010 Grand Caravan. There's now a 2013 red Dodge Grand Caravan (#530) instead of a 2008 Grand Caravan.